Art skills for the working man: Industry and the Schools of Art. 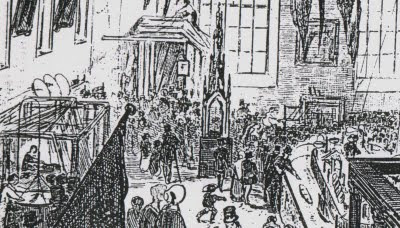 Illustration: William Bell Scott, detail of Hall of Machinery, 1848 Newcastle Polytechnic, Gateshead Observer. A set of seventy based on the idea of Claude Lorrain's (c.1604/5-1682) Liber Veritatis [Book of Truth]. Ruskin was a keen collector and user of the Liber, claiming that he understood light and shade after studying the prints. Fourteen thousand companies exhibiting. Science, art, technology, goods wrapped into one giant spectacle and sold as family tourist attraction. Mixing of classes and visitors in the capital a cause for anxiety and new techniques of surveillance. The Duke of Wellington insisted on 15000 troops being stationed in the capital. Admission prices varied according to the date: 3 guineas a day, £1 a day, five shillings a day, down to one shilling a day. Benjamin Robert Haydon Lectures in Newcastle, at the Nelson Street Music Hall. Haydon was opposed to the monopoly of the Royal Academy and campaigned from 1835 onwards for an alternative to be widely available. • Art schools existed in both these cities: 1821 for Birmingham; in Manchester from 1803 (which closed) then 1831. • The Manchester school was the first to apply to the Council of the Board of Trade at Somerset House for funds to keep the classes going. • A paper had been read at the Lit and Phil in September 1836 on the want of provision for Fine Arts in the neighbourhood, particularly in relation to “designing for manufactures.” A lecture was held at the Mechanics Institute. • The result was the formation of a committee to investigate setting up a school. Letter were written to the Royal Academy in London and to the Royal Institution in Edinburgh. • The objects of the school included the teaching of the “higher departments” of the fine arts as well as design for manufacturers. • Formed the North of England Society for the Promotion of the Fine Arts. Held exhibitions in 1838 and ‘9. • William Harrison had begun to teach Geometry, Projection and Perspective his pupils paying 6d/week. • Parliament did not vote a grant of money to the Board of Trade for the schools project until 1841 at which time Newcastle submitted a petition in the form and language required by Parliament. • This document asserted the national importance of the local industry, the lack of educational facilities, the strong local feeling in favour of the introduction of an institution and the dangers from foreign competition. • Bell Scott claims to have hung up the rules but ignored them. • Private classes were given by Bell Scott in the school, despite resistance from long-established local artists such as Thomas Miles Richardson, who is said to have written to the Department of Trade to complain. – Report of the Select Committee of 1849, Appendix No. 5, Letter from the Committee of the Newcastle School appealing for a reinstatement of their grant. • 1849 : Enquiry and reform: Richard Redgrave and Henry Cole. • We know from his letters that he showed an interest in the careers of a number of his pupils and assistant masters. • His classes were conducted on the basis of inspiring the pupil to practice their skills outwith the school. Some masters were confident that within forty hours of tuition in a year a child could be taught to draw. “From his home we went to the Working Men’s College, where they utterly repudiate copying and the ideal. Here every student has a piece of rough stick hung up three inches from his face to copy, and after two or three sticks they are encouraged to draw the human figure and face in the same manner. The mind being thus uninfluenced, and the taste untrained by the antique or miles of art you cannot believe what hideous things are produced as pictures of children or other of God’s creatures that sit to them......This system is a most interesting experiment, the conventional artist and technical art would quickly expire through inanition if this education were general and that would be a happy day, but it requires yet a fuller development.” William Bell Scott, Trevelyan papers. • [Tyre’s] successor, like her in perfection of beauty, though less in endurance of dominion, is still left for our beholding in the final period of her decline: a ghost upon the sands of the sea, so weak--so quiet,--so bereft of all but her loveliness, that we might well doubt, as we watched her faint reflection in the mirage of the lagoon, which was the City, and which the Shadow. I would endeavour to trace the lines of this image before it be for ever lost, and to record, as far as I may, the warning which seems to me to be uttered by every one of the fast-gaining waves, that beat, like passing bells, against the STONES OF VENICE. • By 1860 economic conditions were such that men were often “ill-fed”. Ruskin changes his emphasis from that point, seeking alternatives to the economic and political system that seemed so wasteful. • 1851-2: first Sunderland classes. Dixon the first secretary. • 1860 the Sunderland master “starved out”. • “I think it was closed for want of support on the part of the district : they found that they were some few pounds in debt, and they allowed the casts to be sold and several things to be sent to Carlisle.” Select Committee Report. • 1869 Sunderland resumes classes. – The School of Design at Newcastle, Quentin Bell, Research Review, 1958, pp187-192. – Milburn, Geoffrey, (1984) Thomas Dixon of Sunderland (1831-1880). A study in local and cultural history, Antiquities of Sunderland, XXIX 1984 pp.5-45.